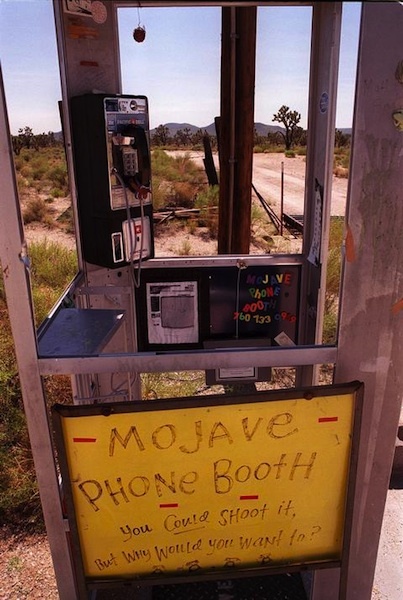 THE MOJAVE PHONE BOOTH--THE BOX WAS HAUNTED BY MAGICAL ENERGY. 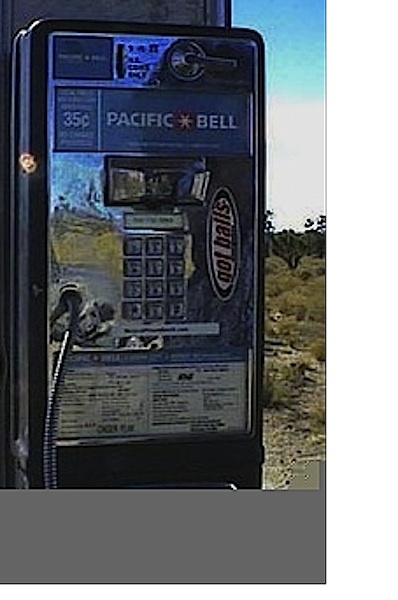 Sadly the desert phone booth no longer exists, here are some photos of the now long gone phone box. Keep sending me pictures of this unique telephone booth. 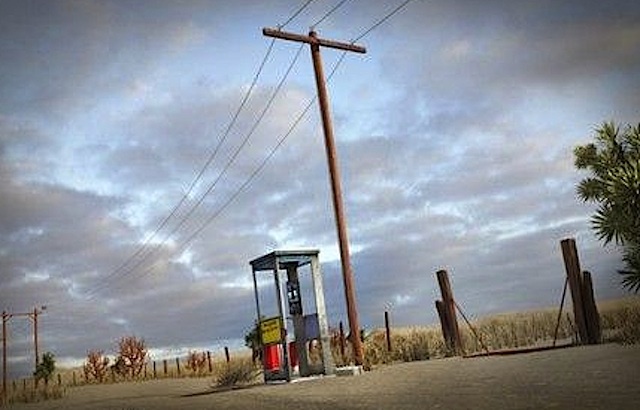 It is not that much of an exaggeration that the Mojave Phone booth was located at the end of the world. However where the world ends, was a desolate but beautiful place! 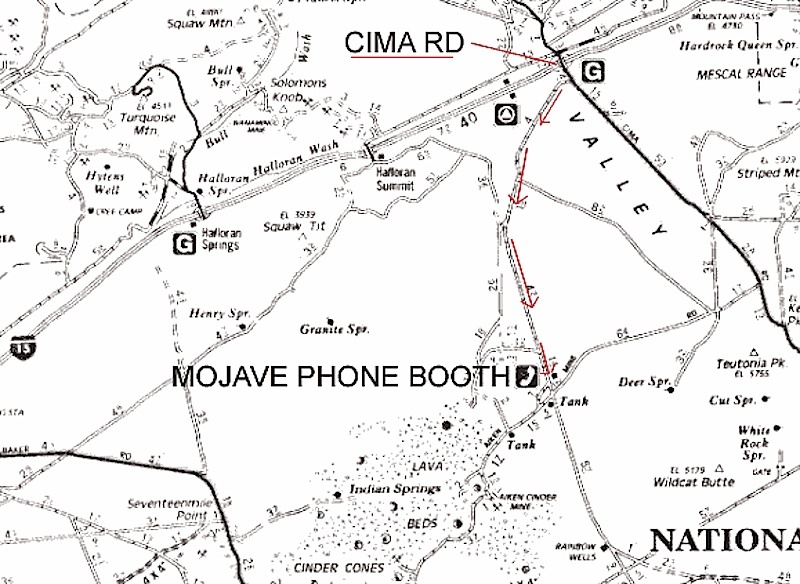 Up until the 1980s the Mojave Phone booth was basically an unknown telephone that was located in the desert. 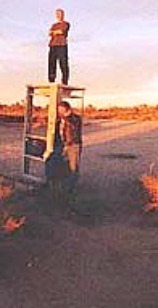 During the 1980s some western newspapers mentioned the phone booth by way of articles, so a few adventurers went out to find it. 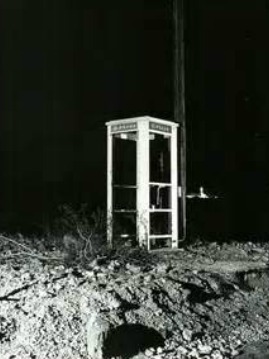 But the phone booth pretty much remained an unvisited site. 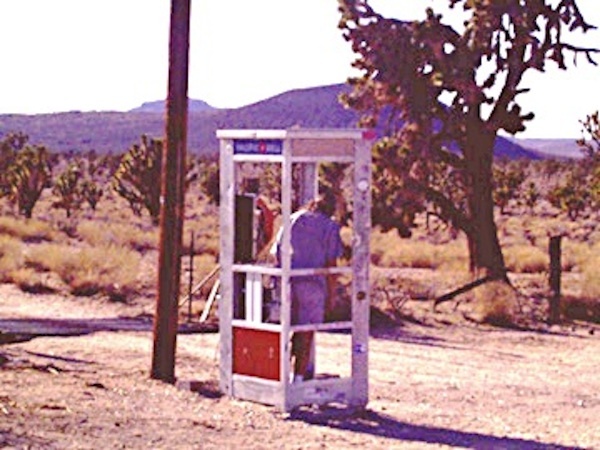 When the story hit the internet in the 1990s, that there was a phone booth located out in the middle of nowhere, the phone booth became the place to go to, or the place to find. WHY? 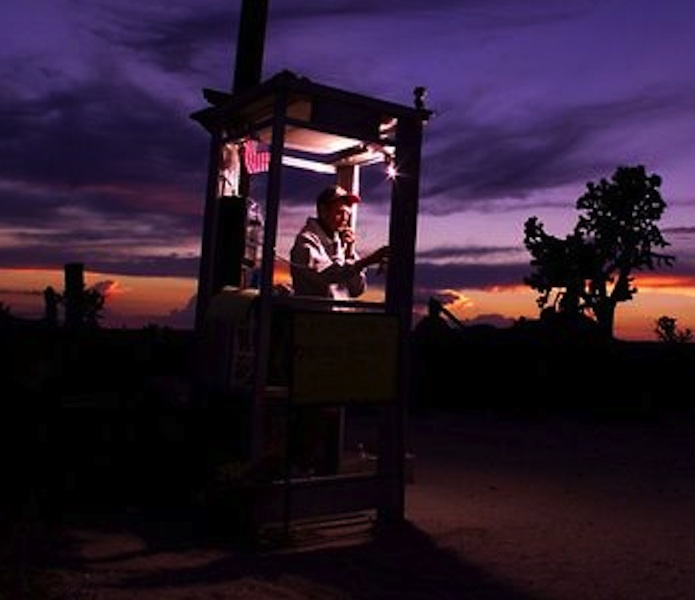 The phone booth in many ways was located at the edge of the world, consequently adventures wanted to visit the end of the world and find the phone and call out. 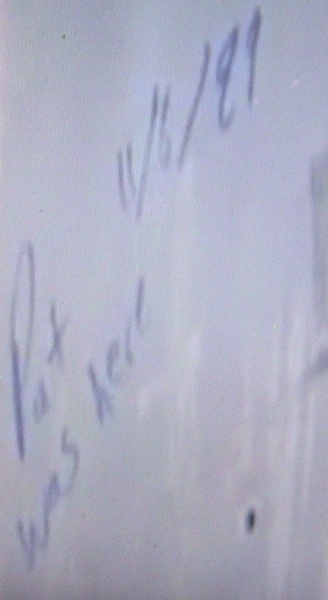 "KILROY WAS HERE". 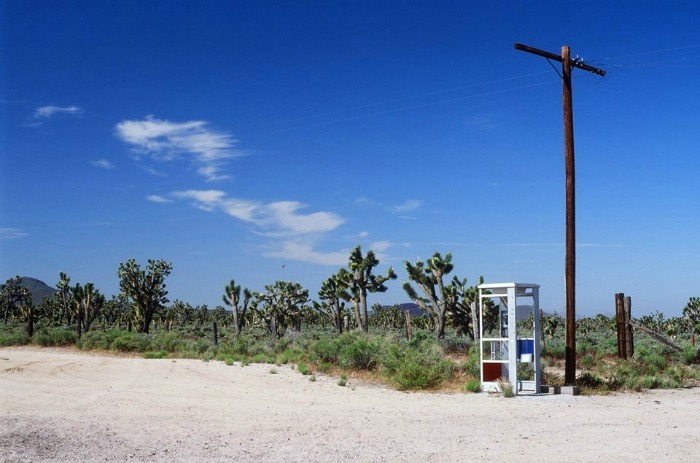 Those that could not visit the desert would call the telephone that sat in the middle of the desert in hope of speaking to somebody who was there at point X--where the world ended. Why was the phone so attractive to so many, as in calling in or visiting it. 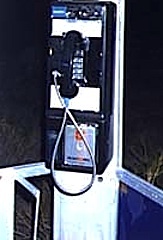 I maintain, that the good energy of those that went to this phone or called in, left a wonderful haunting magic at this place. Later on people wanted to feel or be part of that energy. 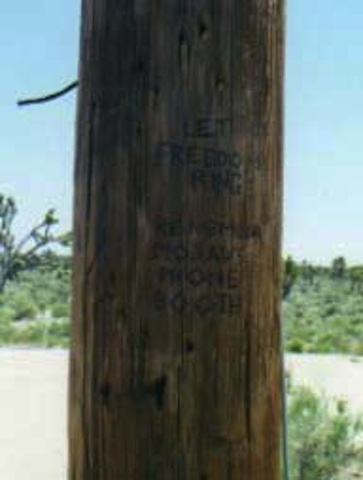 In the late 1990s due to the phone being noted in internet articles, it seems the desert telephone became a modern "GRAIL". Because people from all over the world went "GRAILING" to the Mojave desert in hopes of finding it and phoning from it. PHOTOS FROM THE 2OTH CENTURY! MOJAVE TELE! BELOW: Somebody with an embossing device put "NOBLE" up on one the booth's metal beams. 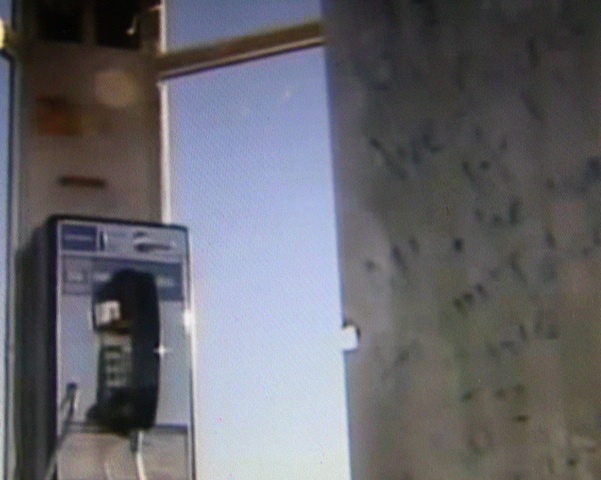 That word sums up the Mojave Phone Booth. 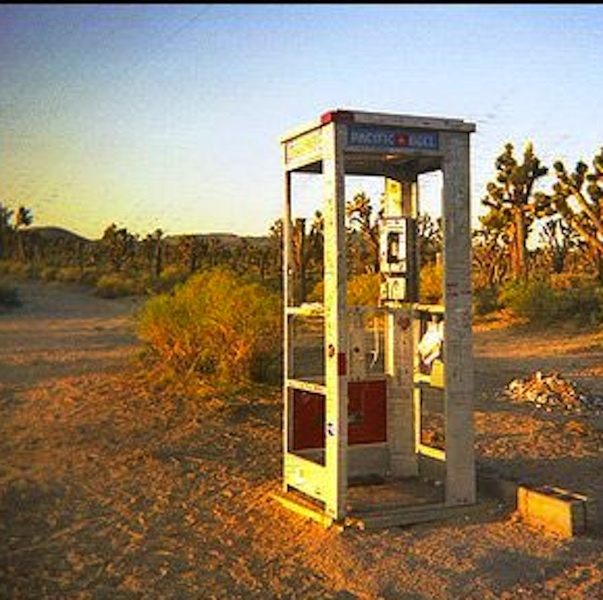 THE MOJAVE PHONE BOOTH, IT ABSORBED THE GOOD ENERGY OF THOSE WHO TREKKED AND FOUND IT! THE PHONE AT THE EDGE OF NOWHERE! BELOW: JACK BURTON ON HIS WAY TO USE THE HAUNTED MOJAVE PHONE BOOTH -- WINK-WINK! BELOW: WHERE THE HAUNTED MOJAVE PHONE BOOTH ONCE STOOD. IF YOU DO GO OUT THERE --- TO SEE WHERE IT ONCE WAS ---TAKE WATER ---TAKE WATER ---- TAKE WATER -- AND SHOVELS -- YOUR CAR CAN GET STUCK OUT THERE -- AND BE READY TO WALK TO CIVILIZATION. 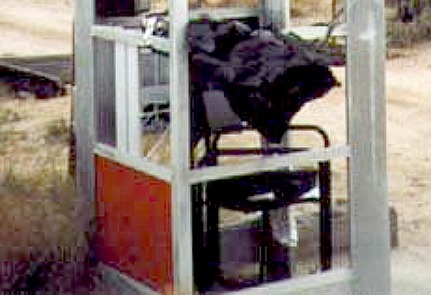 BELOW: While it was there --- the MOJAVE PHONE BOOTH was akin to the "GUARDIAN" of the 1960s STAR TREK series. Yes, it was a portal of sorts to places all over the world and beautiful energy. That energy or vibe haunted the location. 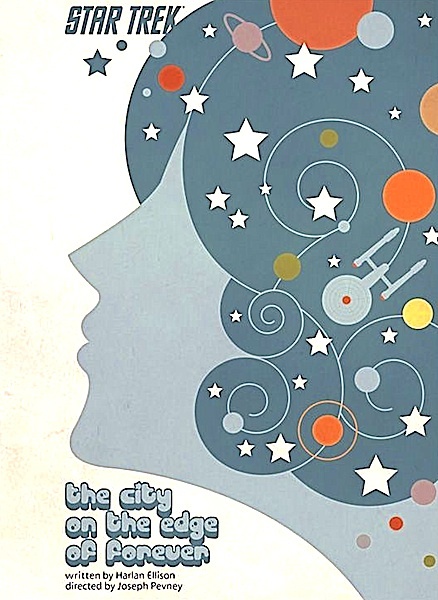 On April 6, 1967, the episode of "CITY ON THE EDGE OF NOWHERE" premiered on Star Trek, the fantastic script was penned by HARLAN ELLISON and butchered by MR. EGO (Gene Rodenberry). However Ellison's writing shines through on this program. 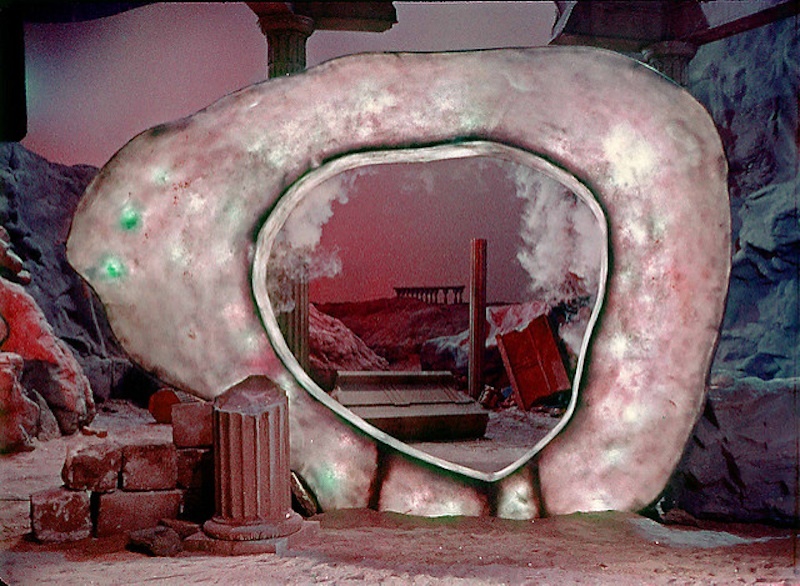 Kirk and crew come across a time machine in the middle of nowhere, that looks like a Winchell's doughnut. The portal communicates with Kirk & Spock, it is called "GUARDIAN", it is a compelling machine. 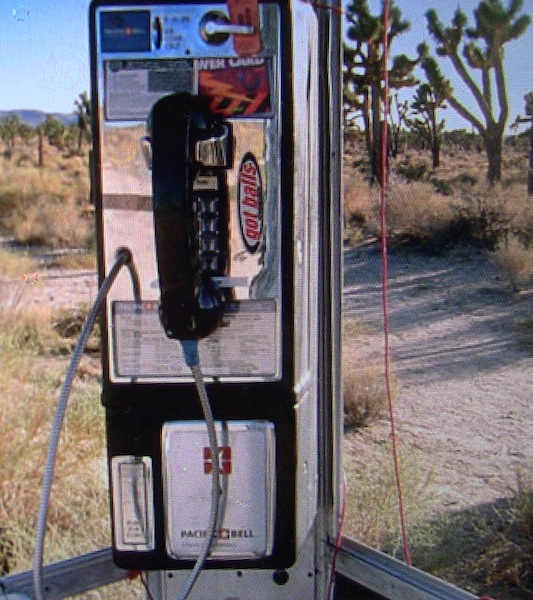 The point being is that as far out as this reads, the MOJAVE PHONE BOOTH was like the "GUARDIAN" machine. 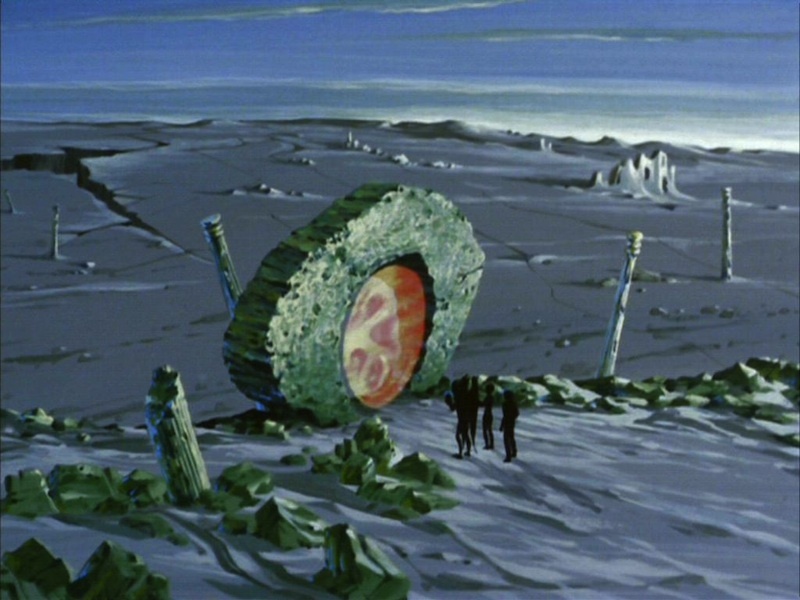 It was a portal or a machine to the rest of the world that was located in the middle of nowhere. 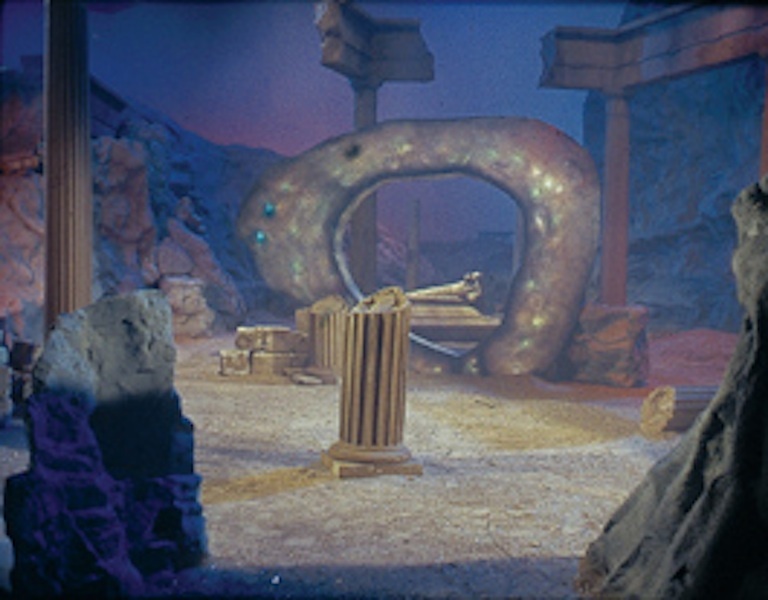 ABOVE & BELOW: the "GUARDIAN" machine from STAR TREK… It was a machine that could reach out to other places. 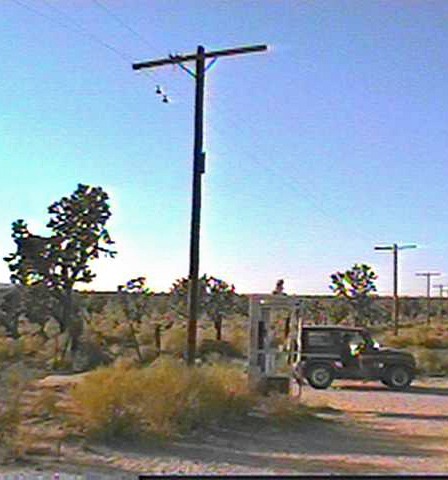 That is what the MOJAVE TELEPHONE BOOTH was, that magical phone box was "THE TELEPHONE ON THE EDGE OF FOREVER. 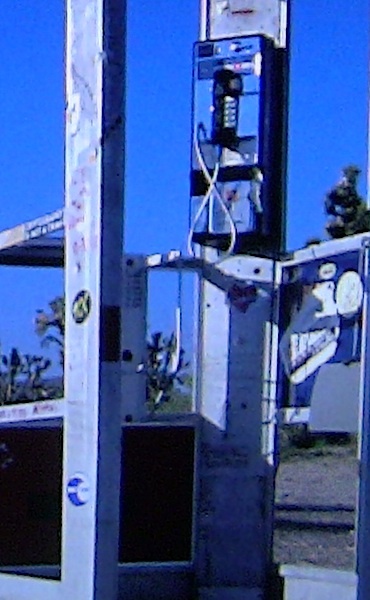 ABOVE & BELOW: The squawk box when it had windows around 1975-76, and the phone booth around 2000. 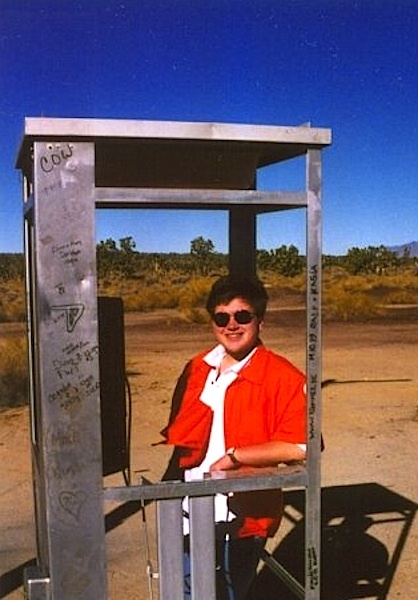 Close to a quarter century of change: The frame, the phone, plates, the area, MOJAVE PHONE BOOTH (changed). As time went on, a lot of visitors put their JOHN HANCOCK onto the booth --- to mark that they had visited the phone booth on the edge of forever! 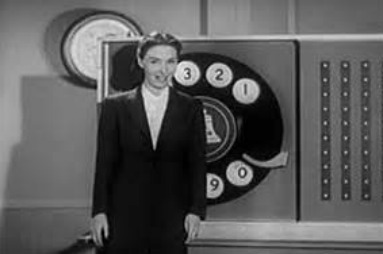 But one constant was you never knew who would call the booth, if you were there you got a conversation from all over the USA and the world. 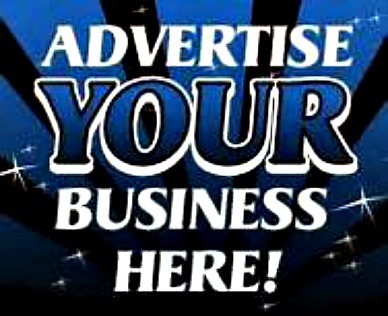 505-986-5002 or 505-231-1336 schedule a tour with Allan when you are in Santa Fe or get him on your radio show. Like what you see, let me tell you about a project that will commemorate this magical phone booth. 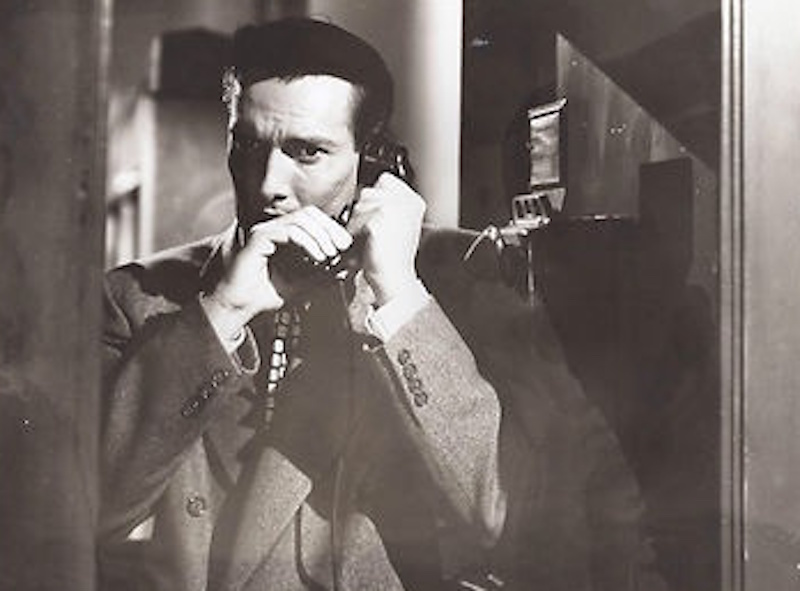 DOC DANIELS found out about the phone a few decades after I had. 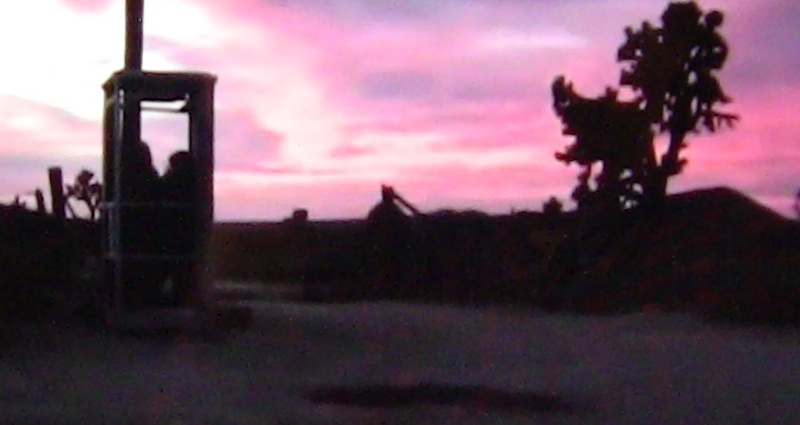 However, Doc shared info on this enchanted place during the 1990s with the world by way the internet. 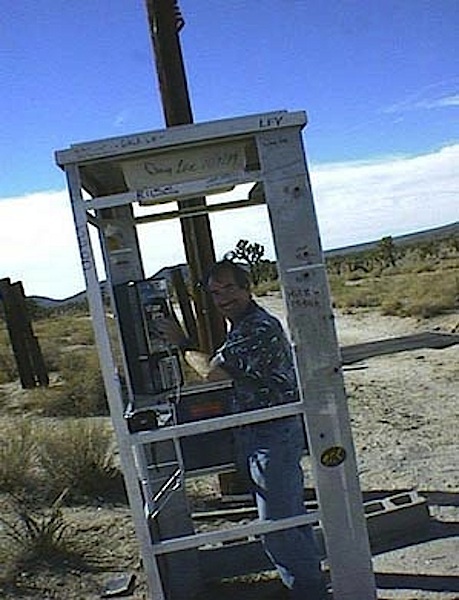 Doc is the Chris Columbus of the MOJAVE PHONE BOOTH. 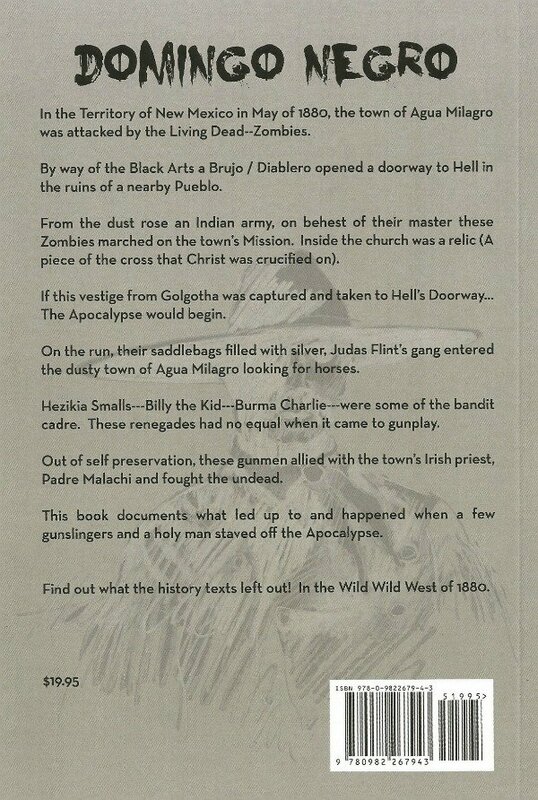 Guys like me (DESERT RATS) were like the Vikings in North America, we did nothing with our knowledge or explorations. 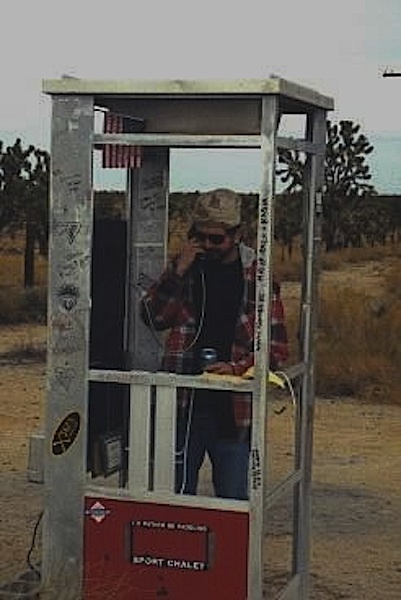 Doc did something with his safaris and now he needs help in getting is project off the ground--MOJAVE PHONE BOOTH commemorative. Go to the page you came in on, bottom of the page, and there is a link to DOC's MOJAVE BOOTH kick starter. 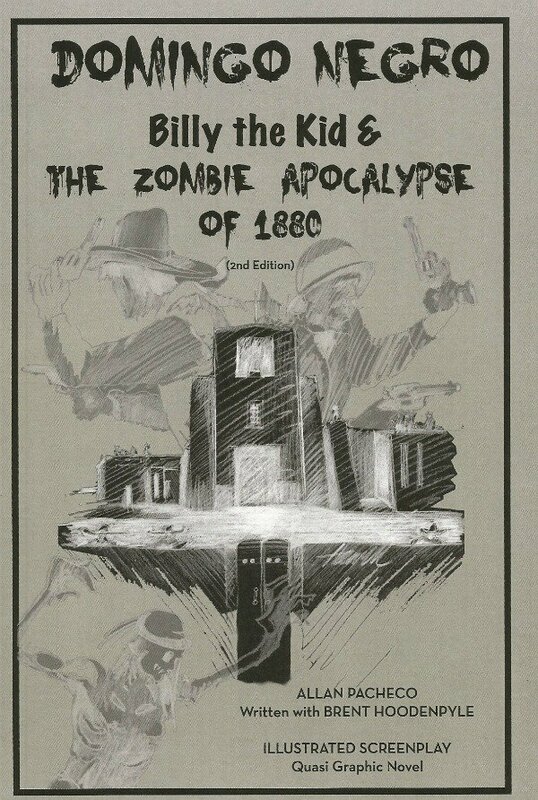 Hey, if you do not help Doc out, then I will be forced to write another odd book concerning this magical place and my adventures out in the desert! 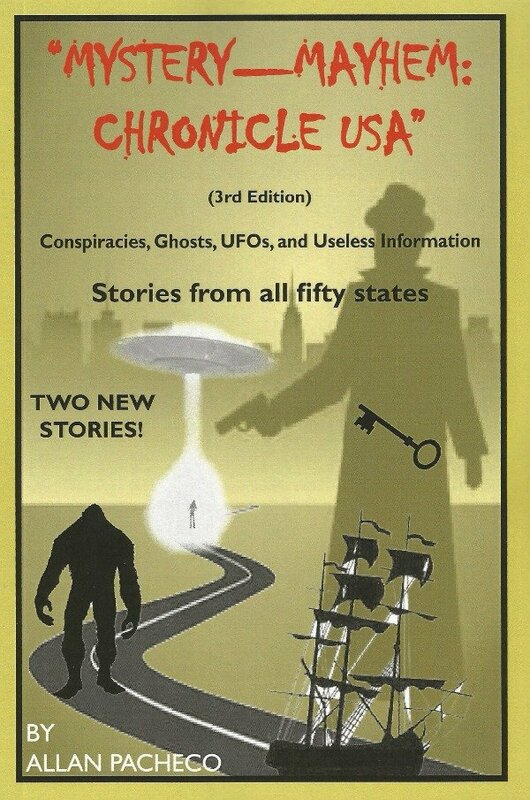 You know how odd my fiction stories are! 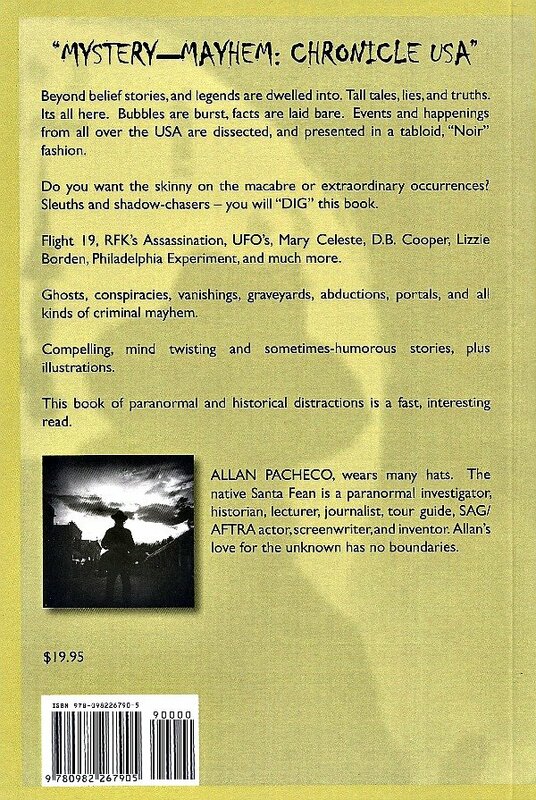 My latest book is below, you can order that by way of pressing the "ORDER" button on the left or go to AMAZON.com.